Flower buns are steamed buns in the shape of a flower and have no fillings, so they have to be eaten with stewed meat like Hong Bak or Tong Po pork. I have made them from quite a number of recipes but this one is from Jo's Deli Bakery. Combine all ingredients in a mixing bowl. Mix and knead (by hand or by mixer) until dough is smooth and elastic. Place dough in an oiled bowl and covered with cling film. Prove for 11/2-2 hour until dough is double in volume. Divide dough to 70g portions. Reserve one portion for this recipe and store the rest in an air tight container and freeze. Thaw to room temperature the next time you want to use the dough starter. Prepare main dough: Sift cake flour, pau flour, baking powder and soy flour into a mixing bowl. Combine flours with sugar, yeast and water. Beat until a smooth dough is formed. To prepare greasing, mix shortening and castor sugar in a bowl. Mix well using a spoon until sugar dissolve a little. Apply the sugar greasing onto dough . Twist the dough . Tie dough into a knot . Repeat for other dough. Cover Flower Buns with a damp cloth and prove for 30 minutes. Boil water in a steamer. Reduce fire to medium heat. Steam Flower Buns for 10 minutes. Serve while Flower Buns are still hot. The dough starter recipe will give you about 4 portions of starters. Store the rest in air-tight container in freezer. Just bring a portion of starter back to room temperature when you need it for other pau products. Use it for making e.g. Steamed Man Tou, Meat & Vegetable Pau, Char Siew Pau (Barbecued Pork Pau) etc. Unlike bread dough, dough for pau product does not have to be kneaded to the thin membrane stage. Knead until gluten is formed in dough. Please adjust water content of this recipe. Remember amount of water required depends on types of flour used, type of liquid used, temperature and humidity of atmosphere at the time of making the pau. Unless the dough is too sticky to work with, avoid using too much flour to dust your working surface. This may result in thick and hard pau skin. Avoid water condensate at steamer's lid from dropping to the man tou. Dry lid with a cloth every time you uncover the steamer. Don't worry if your product is not as white as those sold in the restaurant. This is because you do not use 100% bleached pau flour in this recipe. I mixed pau flour with superfine/cake (low protein) flour so that texture of pau would not be too chewy. 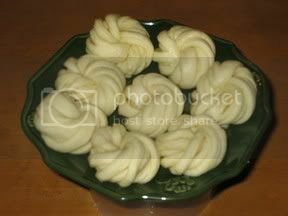 If you are not able to finish all the flower buns at one time, keep them in an air-tight container or plastic bag and freeze. Just reheat them whenever you want to have them. Estimated storage period is 2-3 months. 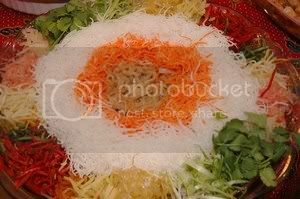 Yee Sang is a salad served during the Chinese New Year and raw fish is sliced very thinly and lime/lemon juice is added to the fish before serving. 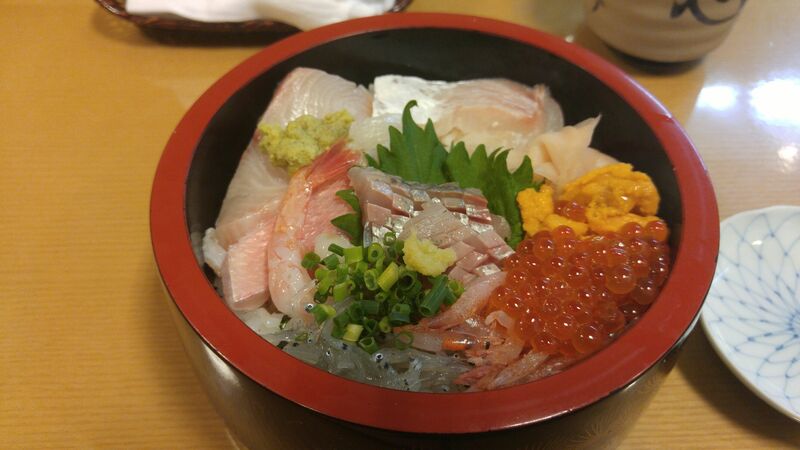 The fish served in this case has to be very fresh which unfortunately is impossible to get here. I have substituted it with jelly fish. Have to make my own qua yin which is sweetened green papaya. add in shred papaya and mix well. one portion color with red and another in green. deep fry them until crisp. Mix all the above ingredients and rest dough for 30 mins. Divide dough into small pieces and roll each piece as thin as possible, like wonton skin. 2. Mix raw fish with lemon juice and brandy. Pour the oil and sauce and toss all ingredients . Cream Puffs are the most perfect dessert in existence: crisp, tender and airy pastry encasing cold, creamy ice cream and napped by dark, luxurious chocolate sauce. Adjust oven rack to middle position and heat oven to 425 degrees F.
Spray large(12 by 18 inch) baking sheet with nonstick cooking spray and line with parchment paper, set aside. Beat eggs and egg white in measuring cup, you should have 1/2 cup(discard excess). Set aside. Bring butter, milk, water, sugar, and salt to boil over medium heat, stirring once or twice. When mixture reaches full boil(butter should be fully melted), immediately remove saucepan from heat and stir in flour with heatproof spatula or wooden spoon until combined and mixture clears sides of pan. Return saucepan to low heat and cook, stirring constantly, using smearing motion, for 3 minutes, until mixture is slightly shiny with wet -sand appearance and tiny beads of fat appear on bottom of saucepan(temperature of paste should register 175 to 180 degrees F on instant-read thermometer). Fold down top 3 or 4 inches of 14 or 16 inch pastry bag fitted with 1/2 inch plain tip to form a cuff. Hold bag open with one hand in cuff and fill bag with paste. Unfold cuff, lay bag on work surface, and, using hands or bench scraper, push paste into lower portion of pastry bag. Twist top of bag and pipe paste into 11/4 to 11/2 inch mounds on prepared baking sheet, spacing them about 1 to 11/4 inches apart (you should be able to fit about 24 mounds on baking sheet). Use back of teaspoon dipped in bowl of cold water to smooth shape and surface of piped mounds. Bake 15 minutes (do not open oven door), then reduce oven temperature to 375 degrees and continue to bake until golden brown and fairly firm(puffs should not be soft and squishy), 8 to 10 minutes longer. Remove baking sheet from oven. With paring knife, cut 3/4 inch slit into side of each puff to release steam, return puffs to oven, turn off oven, and prop oven door open with handle of wooden spoon. Dry puffs in turned off oven until centers are just moist(not wet) and puffs are crisp, about 45 minutes. 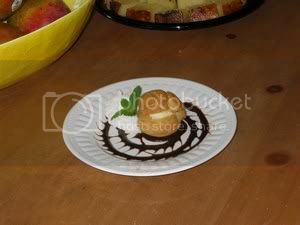 Serve puffs with a scoop of ice cream preferably vanilla and napped with chocolate sauce. Whisk the sauce gently so as not to create tiny air bubbles that can mar its appearance. In Malaysia 'Woo Tau' in cantonese is called YAM but it is TARO here in the States and yam is sweet potato. Fresh taro is available but i have found the frozen ones from Thailand to be better. I have tried a few recipes and added mung beans to the pastry in one recipe which does not alter the taste but in fact enhanced the fuffliness to the pastry. The recipe below is the original but if you wish to use mung beans, reduced 4 ozs of taro and replaced with soaked mung beans. Heat oil and fry the garlic slightly and add in the flour. Stir until flour is cooked. Add in the lean meat, fry until meat is no more pink, then add in prawns. When prawns are cooked, add in the rest of the ingredients. Blend the wheat starch with the boiling water or put 3 ozs water, salt and sugar in a saucepan and bring to the boil. Turn off heat and add in the wheat starch, stir thoroughly until the wheat starch is cooked. Mash the steam taro while it is still hot Add in the cooked wheat starch , ammonia and lard and knead till smooth. Divide dough into small pieces, flatten each piece, place filling in centre, fold and seal edges. Easy Marshmallow Snails is a recipe from Kraftfoods.com . I made the snails using lime jello but the poor snails did not have any antennaes. The picture in the front is made with grape jello and the one on the left is with raspberry jello but presented in different ways. MIX gelatin and water in medium microwavable bowl. Microwave on HIGH 1-1/2 min. ; stir until gelatin is completely dissolved. SET aside 12 of the marshmallows. Add remaining marshmallows to gelatin; stir until well blended. Microwave on HIGH 1 min. or until marshmallows are partially melted. Stir with wire whisk until marshmallows are completely melted. Pour into 9-in. square pan sprayed with cooking spray. REFRIGERATE 45 min. or until set. Run sharp knife around edges of pan to loosen gelatin layer from pan. Starting at one short end, roll up gelatin layer tightly. Cut into 12 (3/4-inch-thick) strips. Refrigerate, covered, until ready to decorate. UNROLL each about 1 inch. 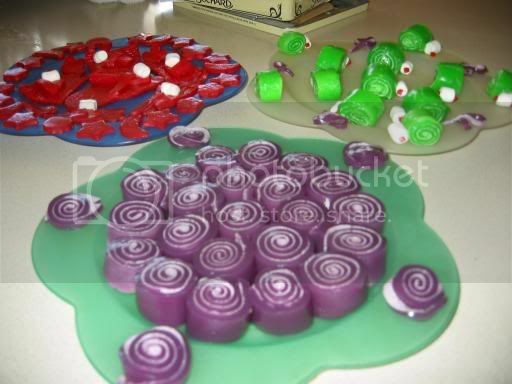 Stand 1 of the reserved marshmallows on unrolled portion of each spiral for the "snail's body," securing with frosting. Insert 2 pieces of licorice into each marshmallow for "antennae," securing with additional frosting, if desired. To Double Prepare gelatin mixture as directed, doubling all ingredients. Pour into 13x9-inch pan. Refrigerate as directed. For ease in handling, cut gelatin mixture in half crosswise before rolling up. Roll up each half separately, making a total of 2 rolls. Cut each roll into 12 slices. Decorate as directed. Kaya means rich so it must be with more eggs for the custard. There are many versions and to each its own. This is my version, simple , fast and rich. 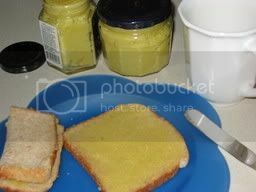 The microwave is used to cook this custard. Stir and whip all ingredients except vanillin in a glass bowl to break up the eggs. Strain mixture. Microwave uncovered for 5 mins on level 4(i am using 1000 watts) and then stir. Repeat again 5 mins on level 4, by now the mixture will be thicker. Continue to Microwave for 3 mins on level 3, remove from microwave and stir. the custard should be thicken by now. This time, cover with cling wrap and leave an opening for steam, microwave on the level 2 for 5 mins. Remove wrap and stir adding in the vanillin and let it cool. 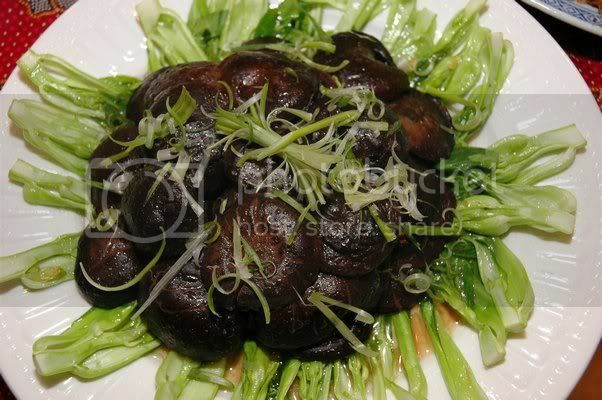 Mushrooms braised this way goes very well as a side for the chicken rice and a topping for noodles, be it wantan noodles, meifun or instant noodles for that matter. If stand alone it as a vegetarian dish. For the chinese new year, a very good grade of dried shitake named 'far koo' - translated as 'flower mushroom' for the pattern that is on the mushroom.surface and the color is paler. Braised slowly and the mushrooms taste better than chicken meat. Remove stems and put mushroom caps in a saucepan covered with water and bring to the boil. Discard the liquid and wash the mushrooms thoroughly. Return mushrooms to saucepan and cover with water and let mushrooms soak till double its size. Drain the mushrooms and squeeze them dry. Make a marinade with salt, ginger and spring onion juice, soya sauce and sesame seed oil and marinate the mushrooms for 10 minutes. Heat oil and saute garlic. Add in the marinated mushrooms and saute until fragrant. Add in the rest of the ingredients except the rice wine. Bring to a boil and reduce to simmering for 30 mins. Uncover so that the sauce reduced slightly. Add rice wine , bring back to the boil and add in cornstarch mixture to thicken. Lastly add in sesame seed oil. 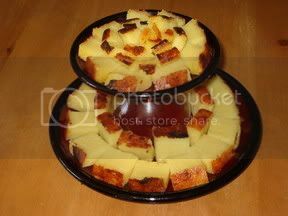 Baked Tapioca Cake is very easy to bake and it is not so laborious when you are baking it here in Aurora, Colorado as grated tapioca is available frozen and coconut cream comes in a can. Grease a 6" x 6" square tin. Mix all the ingredients in a large glass bowl and microwave on high 1 minute at a time until mixture is thick. Pour into greased tin and bake for 30 minutes. Glaze the top with 1 tbsp of coconut cream and broil/grill until brown. 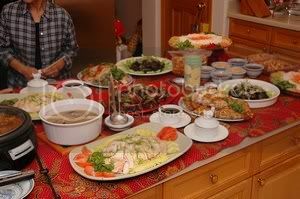 Hong Bak is in hokkien and the nyonya will call it Babi Hong. It used to be the family favorite when my mother in law was alive. It is delicious served with plain rice or crusty bread like the french baguette. For convenience, prepare spice paste first. Grind or poujnd all ingredients for spice paste. If powdered substitutes are used, blend into paste. Cut pork into 5 cm cubes. Heat oil, lower fire and fry spice paste until fragrant and soft. Add pork and stir fry. Add sugar and salt to taste. Add water and allow to simmer, stirring at regular intervals. Dish is ready when pork is soft and gravy is thick. Add the hard boiled eggs. There should be a separation of oil and gravy. This cake was inspired by Jo from Jodelibakery but obviously what I made is no comparison to what Jo made. The cake was so beautiful and I had to make it and since i don't have cake emulsifier, I could not use her recipe but I used her recipe for her Raspberry Swiss Roll instead. Beat the sugar and egg yolk(A) until creamy. add vanilla, corn oil and milk and mix well. Sift cake flour, cornflour and baking powder into egg yolk mixture and fold till well combined. In another clean mixing bowl, whip egg whites and cream of tartar until foamy. Add the sugar(B) and continue to whip until stiff peaks form. Take 1/3 of egg whites and fold into the egg yolk mixture. Mix until combined and add in the rest of the egg whites. Fold in gently. Divide mixture into 2 portions. 2/3 portion will be plain and fold in the cocoa mixture into the 1/3 portion and mix well. With a tablespoon, scoop 4 heaped tablespoons of plain batter into middle of cake tin, then scoop 4 less heaped tablespoons of cocoa batter and drop it on top of the first plain mixture. continue this procedure but using less batter as you go. Bake in oven for 35 - 40 mins until done, test with a cake skewer. Take cake out of oven and invert cake. Leave cake inverted until cooled. When cake is cooled. 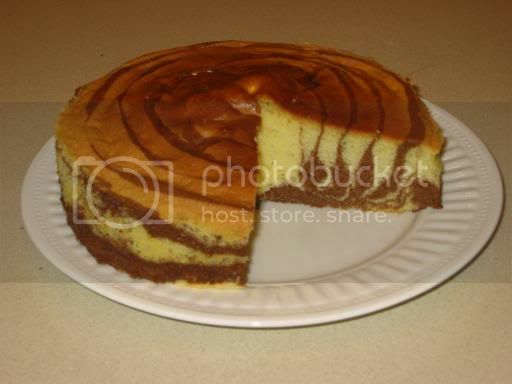 Run a knife along the sides of cake pan before removing the springform. 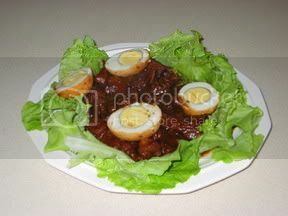 A wonderfully versatile chicken dish: the meat can be used in salads, eaten cold or hot, or carved into slices in the traditional Chinese manner and served with a dipping sauce of soy, oil, shallot, ginger and spring onion. The meat is tender, succulent and delectable and the white and red parts are distinctly coloured. The poaching method using hot as opposed to simmering stock ensures that the breast meat is not tough or stringy, the great test for any whole chicken dish. 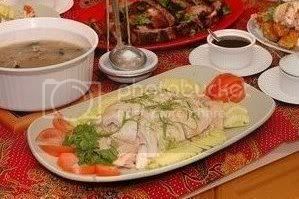 The shallot and ginger offset the metallic taste which is sometimes present in plain poached chicken. A little red blood in the centre of the chicken bones is acceptable, otherwise the cooking time would be too long for the meat. To ensure a perfectly finished dish, the lifting and re-submerging of the chicken must be done without breaking the skin. Drizzling soy sauce and warm peanut oil over the meat pieces will add to the flavour if you do not have time to prepare the dipping sauce. Peeled cucumber slices on the base of the plate adds colour and a taste and texture contrast. Country people, who eat mainly rice, use dipping sauces to add flavour to their meals. Season the chicken cavity with salt, soy sauce, ginger, spring onion and rice wine and leave aside for 1 hour. Fill a large pot with water and bring to the boil. It is essential that the chicken be fully immersed at all stages to ensure thorough cooking. Blanch the chicken, 1 minute at a time, a couple of times, carefully lifting it in and out of the pot under the wing, so as not to bruise the skin. This process of 'changing the water' washes the salted cavity of excess blood and impurities, and at the same time, seals the cavity. Remove the chicken, and refresh it in very cold water to firm the flesh and seal the skin. In another pot, bring chicken stock to the boil with the slice of ginger and spring onion stalk then lower the chicken gently into the stock with a carving fork just under the chicken wing, taking care not to bruise the skin. Repeat the same lifting and submerging process used during the blanching process, this time to heat the cavity, which will be less cooked than the exterior. Then submerge the chicken completely in the stock. Bring the stock to the boil, skimming off any impurities. Remove the pot from the stove and allow the chicken to steep in the stock for 25 minutes(30 mins for 2 kg chicken. 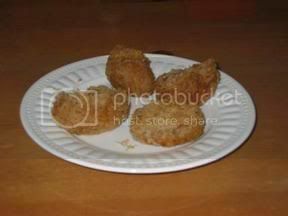 Remove the chicken gently from the pot and place it on a serving dish to cool for 30 minutes. By this time the bird is fully rested and is ready for slicing. Pound ginger and spring onion to a paste, add soy sauce and shallot oil. Heat up oil, saute chopped garlic and shallot and ginger until fragrant. Add rice, salt and mix well. Dish into a rice cooker, add chicken stock and taste(add more salt if required). Leave to cook until dry and fluffy. Pound/blend red chillies, chilly padi and ginger. Mix in the rest of the ingredients and adjust taste accordingly. To remove blood and impurities, plunge the bones in boiling water. Bring the water back to the boil and remove the bones. Refresh them in cold water. Place the bones in a stockpot and cover with 3 litres of water. Bring to the boil and skim off any impurities. Simmer for 11/2 hours. Add vegetables and herbs and cook for a further 30minutes. Ten minutes before the end of the cooking process, add the salt and peppercorns. Strain the stock through a fine sieve, then through a muslin cloth. Chill, then, when you are going to use the stock, or freeze it, remove any remaining fat. Because it has not been exposed to dry heat, white chicken stock does not brown. It is used for general purposes, such as soups and sauces and for dishes where color is important, such as vegetables, rice and cream or white colored sauces. A dense chocolate cake made in a Bundt pan. Dust with confectioners' sugar and shredded lemon or orange peel. Preheat oven to 325 degrees F(165 degrees c). Grease and flour a 10 inch Bundt pan. Mix together the flour, cocoa, baking powder and salt. set aside. In a large bowl, cream together the butter and sugar until light and fluffy. Beat in the eggs one at a time, then stir in the vanilla. Beat in the flour mixture alternately with the dissolved coffee and buttermilk. Pour batter into prepared pan. Bake in the preheated oven for 60 - 70 minutes, or until a toothpick inserted into the center of the cake comes out clean. Let cool in pan for 20 minutes, then turn out onto a wire rack and cool completely. 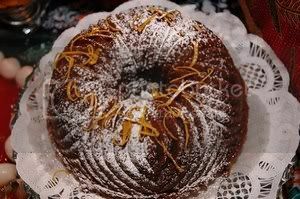 before taking bundt cake out of oven, i microwaved a damp cloth for 1 min on high and then remove cake from oven and puts it on top of hot cloth. let it sit for 3 - 5 mins, then the cake will come off the bundt pan easier. 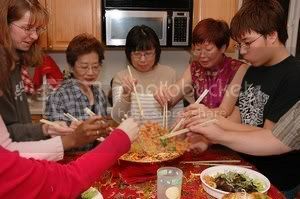 The year 2005 started off very well for a rooster like me who has come full cirle 5 times around and to celebrate the new rooster year are friends enjoying the loh hei that i made.